The purpose of this study was to determine the influence of different levels of regular physical exercise on the frequency of urinary incontinence in young nulliparous women from the northern region of Portugal. Participants (n=386) self-reported demographic variables, frequency, and time spent practicing organized exercise per week, as well as completed the International Consultation on Incontinence Questionnaire-Short Form. The level of exercise was calculated based on the time (in minutes) usually spent per week in organized exercise. 19.9% of Portuguese nulliparous women reported incontinence symptoms. Considering the distribution of urinary incontinence among the different quartiles of organized exercise, women from the 4thquartile (those who train for competitive purposes) demonstrated highest relative frequency (p=0.000) and a 2.53 greater relative risk to develop (95% CIs,1.3–2.7) incontinence compared to women from the 1st quartile (inactive). Women who practice exercise for recreational purposes (2nd and 3rd quartiles) did not show significant differences in the urinary incontinence prevalence and relative risk of developing it compared to women from the 1st quartile. The results showed that women participating in organized exercise involving high volume training for competition are potentially at risk of developing urinary incontinence, although organized exercise undertaken without the intent to compete seems to be safe for maintaining urinary continence. 7 Da Roza T, Brandao S, Mascarenhas T, Jorge RN, Duarte JA. Volume of Training and the ranking level are associated with the leakage of urine in young female trampolinists. 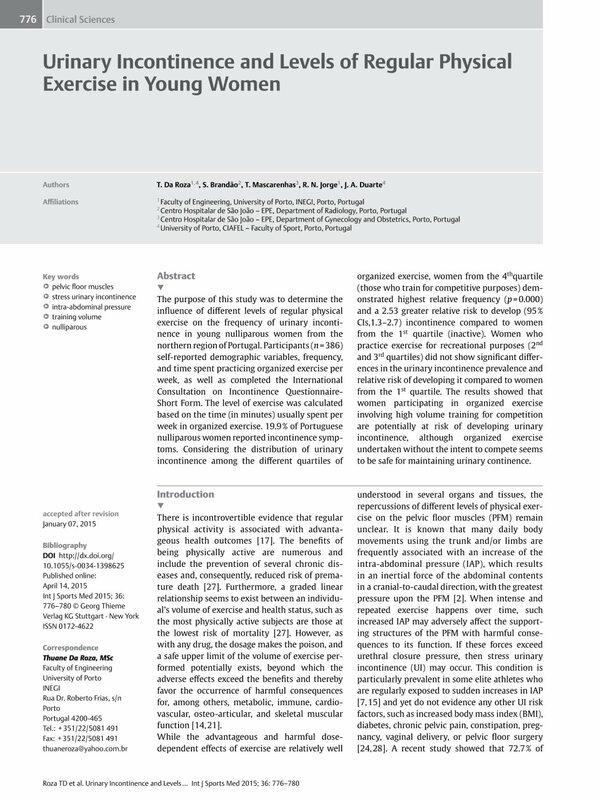 Clin J Sport Med 2014; DOI: 10.1097/JSM.0000000000000129.